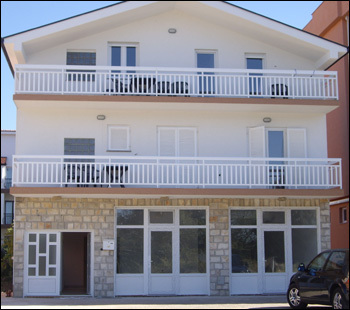 Pansion Stephen offers Pilgrim/holiday accommodation, B&B, HB and FB facilities in Medjugorje for groups of up to 30 people, and is situated on the main road between St. James's Church and Mount Krizevac. It is central to all sites mentioned in 'Guide to Medjugorje'. If you are unable to walk just book a local taxi who will take up to 4 persons for €5 one way. Bed and Breakfast, Half Board and Full Board is provided, as well as Towels and Bed Linen. Family Rooms are popular facilities. A child under the age of 2 years old is free. Grocery Stores and numerous Bars and Restaurants serving local cuisine are available nearby. Smoking is not permitted inside the property. Free parking is available in the car park located in front of the building. Transport to and from Airports and Harbours can be arranged for large and small groups on request, but please check accommodation availability prior to booking your own flights. The main Bus Station is approximately 15 – 20 minutes walk from Pansion Stephen. I hope you enjoy browsing the Pansion Stephen website, please remember we are just an email away. There is a €5 supplement per night single room supplement. Children aged 2 - 10 years old - 50% discount. There is a 10% discount for a group of over 20 Pilgrims.